Need to store your boat safely when you’re on the move? Looking for a lightweight, Australian made marine trailer? The best option, is to invest in an aluminium folding boat trailer from Almac Trailers, we’ll tell you five reasons why. With an aluminium folding boat trailer, the manoeuvrability and launch of your tinny has never been easier. An aluminium folding boat trailer is your must-have marine accessory because it is practical. When you travel with your tinny, simply fold down your trailer to pop your boat on your roof rack, or secure on the back of your caravan. An Almac Trailers boat loader is a roof rack in itself, and therefore no other racks are required. Don’t struggle with a bulky boat trailer, which is both heavy and difficult to use. An aluminium folding boat trailer collapses down easily, and can be stored almost anywhere. With a folding boat trailer, you can set up camp at your destination, and you can be ready to get your boat out on the water whenever the moment takes you. Almac Trailers’ folding aluminium boat trailers are the leading products in their class within Australia. Boat trailers are made with marine grade aluminium; a metal that can withstand sea exposure and therefore resists corrosion. This means you can get be water bound whenever you please, and you won’t need to worry about short-term effects of rust or wearing. Marine trailers and loaders from Almac Trailers are designed in Australia and Queensland made. 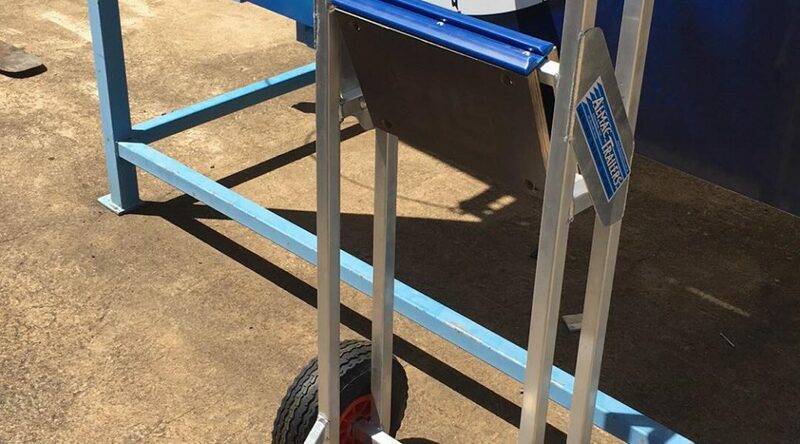 Folding aluminium trailers have been custom made by East Bundaberg Engineering since 1988. All Almac Trailers products are built by highly skilled tradesmen using modern welding techniques, so you can be sure your aluminium folding boat trailer is as strong as it is sturdy. Because boat trailers are made in Australia, you won’t need to wait for orders to arrive from overseas, plus you are supporting local small business when you choose to buy from Almac Trailers. It is also worth noting, all boat trailers come with a 12-year guarantee. The advantage of an aluminium folding boat trailer is not only its compact size, but also its weight. Almac Trailers’ boat trailers weigh only 38kg, meaning you won’t bust your back when you’re attaching your tinny to your vehicle. This also means you won’t struggle getting your boat down to the river’s edge when it’s time to get out on the water. Single fold aluminium boat trailers collapse down to 2.1m in length, otherwise double fold boat trailers collapse down to 1.5m. Due to their compact size, an aluminium folding boat trailer is the most efficient method of transport for your tinny, particularly if you’re short on space. Bear in mind, Almac Trailers folding trailers may be compact, but that doesn’t mean they aren’t tough; they can pull boats between 3.5 and 3.8 metres in length. Don’t struggle with a cumbersome, heavy trailer. Contact Almac Trailers and get yourself a lightweight equivalent that will do the job just as well, if not better, than most on the market. You can be sure that Almac Trailers aluminium folding boat trailers are the best choice for your car, caravan and boat. Contact the friendly team today on 07 4152 3737, visit us at 46 Alexandra Street, Bundaberg or complete our online contact form.